Have you ever opened your humidor and discovered blue-green fuzz on your favorite cigar? It’s the situation every cigar aficionado dreads. Is it mold? Keep reading to learn if it’s mold, and how to remove it. Plus, learn how to prevent humidor mold from happening again. Mold most often grows on cigars when they’re inside a humidor. Humidor mold usually appears when the relative humidity inside the humidor is over 75%. Higher temperatures (77 degrees or more) also increase the chance of mold growth. Another cause is poor airflow. An overcrowded humidor can prevent air from circulating. When the air is stuck and saturated with moisture it can cause mold. The early signs of mold are small random spots. Unchecked, those dots can grow into thick, fuzzy areas. The first step in identifying mold is to determine what color it is. Mold can be white, green, black or blue. Blue or blue-green fuzz is mold. It smells like mildew. Can you brush the mold off the cigar? If a stain or discoloration remains on the tobacco, it’s definitely mold. If the blemish is white, it may be bloom (plume). Bloom is a good thing. It’s discussed later in this article. If you find mold on your cigars, follow the detailed steps below to remove it. Remove all the cigars from your humidor. Look at each one and determine it’s condition. Heavily Infected: Discard these cigars. You don’t want to smoke mold. Salvageable: If the mold is minimal, you can rescue these cigars. Separate them from the other cigars. Place them into a sealed container for now. Later you will wipe them with alcohol and monitor for a week. Unaffected: Place the cigars with no signs of the mold into a separate airtight container. Put the containers with the salvageable and unaffected cigars into a refrigerator. The cold won’t stop mold growth completely, but it will slow it down so it’s easier to treat your cigars. Once the humidor is empty, use a brush to loosen any visible mold inside it. Vacuum the interior to remove all the mold. Dampen a clean cloth with isopropyl alcohol. Lightly wipe the entire interior of the humidor with the cloth. Too much alcohol will damage the cedar lining, so use a light hand to wipe. Don’t miss a spot! Wipe the walls, bottom and inside of the lid. Don’t ever immerse your humidor in water or alcohol. It may warp and ruin the humidor lining. You want to use just enough alcohol to moisten the wood and kill potential mold spores you can’t see. If the outbreak was bad, you can lightly sand the interior lining with super fine sandpaper. This helps remove any microscopic mold spores in the porous wood. Finish with a final wipe down of the humidor using distilled water. Dry everything thoroughly. Give the humidor a few days to air out completely. It’s best to replace (rather than clean) the humidifier devices in a contaminated humidor. They may have mold spores inside them. After the box is cleaned you can place a new, fully charged humidification device inside. Allow the humidor to acclimate for 5 to 7 days. Check for new humidor mold during this time frame. If you see any mold, repeat the cleaning process: brush, vacuum and wipe down with alcohol. During the 5-7 days when your humidor is acclimating, examine the unaffected cigars in your refrigerator every couple of days. Look for any signs of mold growth. If there is no new mold after 7-14 days the cigars should be considered okay to smoke. Carefully wipe the salvageable cigars that were affected. Use the same procedure you used for the humidor. Wipe them with a clean cloth dampened with isopropyl alcohol before you store them in the refrigerator. While gently wiping the cigars you could discover that the mold leaves a small discoloration on the cigar wrapper. This wrapper blemish should be okay if the cleaning procedure was followed properly. But, if mold spores reappear after 5-7 days, repeat the procedure again. Once the cigars are completely clear of mold you can safely return them to the cleaned humidor. Never put infected cigars back into a humidor. 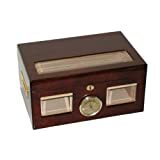 Keep humidor mold from returning by monitoring the situation. Don’t fill your humidor too full. When a humidification device is crowded by the contents or structure of the box, it hinders circulation of the moisturized air. This causes the moisturized air to build up in spots inside the humidor. The moist air can saturate the wood lining, or cause dripping wet humidifiers. These conditions become the perfect breeding ground for mold. The problem is solved by proper cigar storage. Arrange your cigars and humidifier so air circulates freely. Another way mold can be introduced is by handling cigars with contaminated hands. Bacteria, sweat, or food residue can cause mold to form. Avoid the risk of mold by washing and drying your hands before handling cigars in your humidor. Is It Mold or Plume (Bloom)? Mold is usually crusty, and bluish-green in color. If you find a white powdery dust on your cigars, it probably isn’t mold. In fact, it may be a sign that your cigars are properly aged in the correct environment. White or light gray powdery dust on cigars is Plume. Plume comes from the crystallized oils of cigar wrapper leaves. Plume brushes off and doesn’t discolor the wrapper or leave a mark on the cigar. It’s part of the normal aging process. It’s harmless and doesn’t hurt the taste of the cigar. Brush the plume off the cigar when you are ready to smoke it. Humidors are the best way to keep your cigars fresh and ready to smoke. 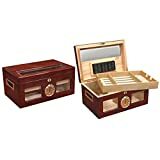 Are you looking for a small humidor or an investment piece to store and protect over 100 cigars? If you’re in the market for any size humidor, read the Cigar Humidor Guy’s guide to the best humidors on the market.